Preheat oven to 350°F. 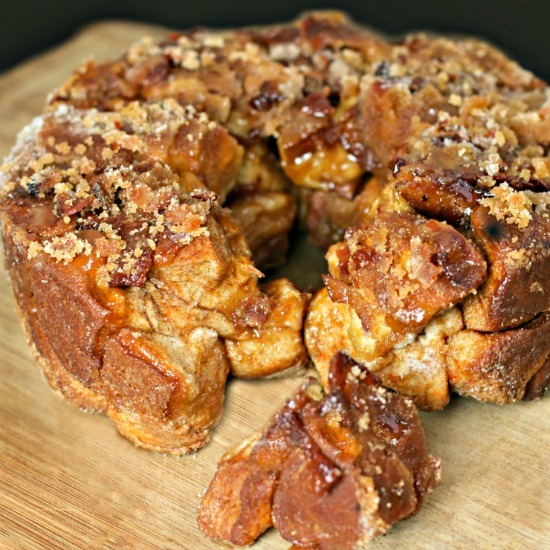 Coat the inside of a 9-inch fluted tube pan or Bundt pan with non-stick cooking spray. In a large gallon size Ziploc bag, mix together the white sugar, caramel instant pudding mix and cinnamon. Add the quartered biscuit pieces and shake until well coated. Toss in the bacon pieces and shake well to distribute. Place the pieces in the Bundt pan. Save any leftover sugar in the bottom of the bag and set aside. Melt butter in a small saucepan over medium heat. Stir in the brown sugar, maple syrup and tiny pinch of salt. Bring mixture to a boil and carefully stir until mixture begins to foam, about 1 minute. Pour the remaining sugar-cinnamon mixture into the brown sugar mixture and stir until sugar dissolves, about 2 to 3 minutes. Pour the brown sugar mixture over the top of the biscuits. Bake in the preheated oven until the biscuits are cooked through, about 50-55 minutes. Cool in pan for about 10 minutes before inverting onto a serving plate. 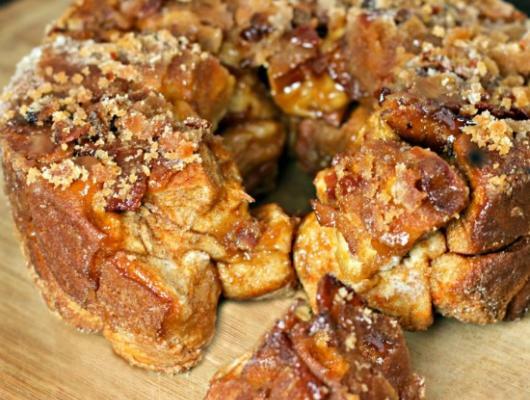 Maple Bacon Monkey Bread is extra gooey and cinnamon-sugar sweet with salty pieces of candied bacon throughout. Easy and Delicious!